It’s the film that famously makes you never want to go into an open body of water again, with just a few bars of that soundtrack enough to cause intense disquiet. The creeping unease, the frantic screams, the shots of blood churned shallows; Jaws is perhaps not the ideal film to watch while preparing for a relaxing beach holiday. Indeed, even when watching the classic shark-infested horror from the dry shores of my sofa, I have found myself tucking all my toes in anxiously. 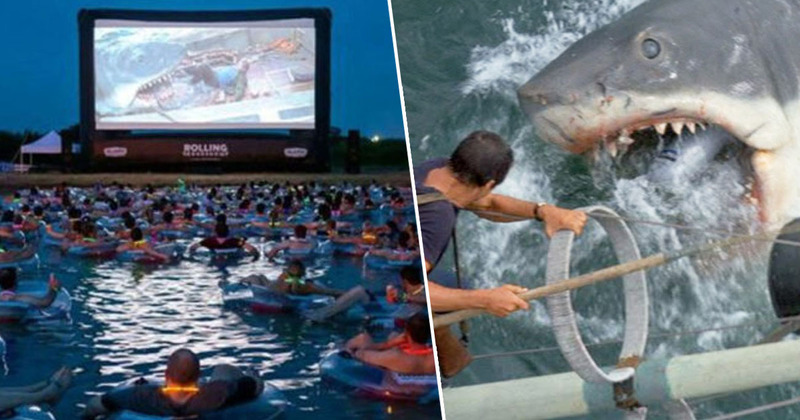 For the fifth year running, The Volente Beach Resort and Beachside Billy’s in Texas will be delivering a special series of summer screenings of Jaws. With the audience swapping comfy cinema seats for rubber rings, splashiness and (eek) dangling legs. The screenings will take place on the shores of Lake Travis, with sixteen ‘dive-in’ screenings being shown from June right through to August. Tickets cost $55, with an illustrated Jaws pint glass and a Jaws-themed inner tube thrown in for the price. For an extra $12 you can get dinner, although I would personally advise against opting for a seafood meal. Tickets to these On the Water shows include full access to Volente Beach attractions (Lazy Lagoon, The Sidewinder, the water slides and more), keepsake shark-ified inner tube, fireworks display and the thrilling, one-of-a-kind experience of watching cinema’s greatest great whites with your feet dangling dangerously and deliciously in the water. Upcoming screenings/screamings are as follows: Friday, June 15, 2018; Saturday, June 16, 2018; Friday, June 22, 2018; Saturday, June 23, 2018; Friday, June 29, 2018; Saturday, June 30, 2018; Friday, July 13, 2018; Saturday, July 14, 2018; Friday, July 20, 2018; Saturday, July 21, 2018; Friday, July 27, 2018; Saturday, July 28, 2018; Friday, August 3, 2018; Saturday, August 4, 2018. Doors reportedly open at 6 pm, with the movie itself beginning after sunset. This could be approximately 8:45 p.m. or later, with the darkening waters no doubt adding to the thrill/terror. #PSYCHO made peeps scared of showers. #JAWS had folks steering clear of the ocean. What scene from a #horrormovie made you scared of even the most mundane things?!? For me, it’s the log truck scene in #FinalDestination2. Lemme know yours in the comments below! In the five year history of ‘Jaws in the Water’, there have – so far – been no nibbled feet or chewed off arms. However, such incidents could well have been hushed up by that dastardly Amity mayor.